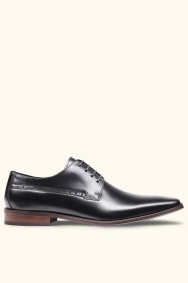 Derby shoes are classic, but they don’t have to be plain. These ones have a subtle line of broguing detail to give them interest without looking out of place under your slick suit. 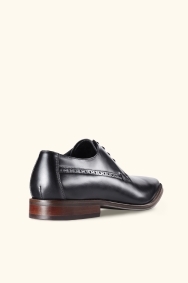 With their sleek shape, they’ll fit in seamlessly with your smart outfits. Made from leather, they’re soft to wear and will mould to suit your feet within a few wears. 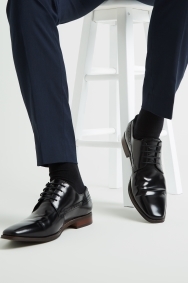 Choose these shoes for your workwear suits. The plain black colour will look best with black and grey. Just remember to keep them polished so you can reach for them whenever you need to finish off your outfit. Extremely comfortable and looks effortlessly stylish. tiptop fitted well. pleased to bits with them. I have always bought John White shoes as they've always felt so comfortable from day 1. Unfortunately on this occasion they are awful, the leather is so hard and has given me blisters on the back of my feet. I have had to buy shoe stretchers in the hope of resolving the issue. From the beginning these shoes have fitted well with no snagging. Have worn them with no side effects like squeezing or blistering. 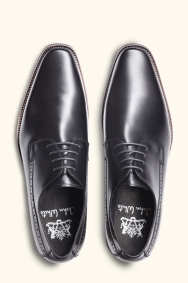 Very smart dress shoes for business meetings. Got a nice discount and some honest advice from the store advisor. No issues with the style and look of the suit I purchased. They looked fantastic and we had lots of comments However, there were several items which were either too small or large, and one of the vests we had had a not so subtle tomato ketchup stain on it. Normally I would put the incorrect sizing down to the fact we rented rather than purchased the suits, meaning we were unable to tailor the sizes. However, several items had clearly been inputted on to the system incorrectly and as a result one of the pairs of trousers were two sizes too big. Decent enough shoes but why not remove barcodes from the bottom of shoes when you send them? Very well made shoe. Extremely comfortable.